Danedream, last season's surprise Prix de l'Arc de Triomphe heroine, lunged late to deny Nathaniel in a thrilling King George VI and Queen Elizabeth Stakes at Ascot. Nathaniel, after going to the front with just over a furlong to race, looked like holding on, but Danedream came to pip him on the post by a nose. Betfair’s in-running market certainly indicated that - the challenging Danedream had drifted to 16/1 in running on Betfair, while Nathaniel traded at 1/10 in running. 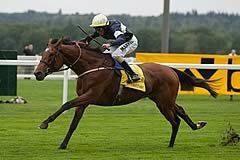 The triumphant trainer Peter Schiergen said: “It is a very good feeling to win my first Group race at Ascot. Before I had places in Group races here. “She has won on all sorts of ground and doesn’t mind. It was a French race last time, it was a good start and then a small pace followed by a sprint and she didn’t like it. She has been better since and last year was the same. She is very relaxed at home and so good in the mornings. “This victory is very important for German racing. She is very good and she wins her races with her head and her heart. 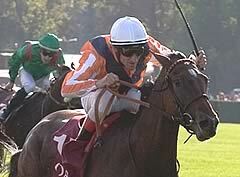 The winning jockey Andrasch Starke added: “I had a good feeling passing the post but it was so close. When people came running to me, I thought I had won. It is an unbelievable feeling. I am very appreciative - it is a great moment for Germany and racing history. “Hopefully, we will go back to the Prix de l'Arc de Triomphe but after today she has done everything - winning the Arc and King George. Everything is a bonus from now on. “We would have been happy with a place after her run last time. She is four now and has had no allowance since last year. Today she improved. There was an unbelievable feeling from German racing fans after her Arc victory and I think after today it is like after the Olympics - German racing will be very proud. England has the toughest races, with uphill finishes. It is tough, especially for a filly. I don’t think there was a bad horse in the race today. “What a moment this is for me! For all of the German racing fans are sitting at home watching the TV - it was an unbelievable feeling today. Nathaniel, who won the Eclipse at Sandown two weeks ago, came within a nose of becoming the first dual-winner of the King George since Swain in 1998, only to be denied by German raider Danedream. The John Gosden-trained colt held the lead entering the final 50 yards, but Danedream, who won last season’s Prix de l’Arc de Triomphe by five lengths, battled on gamely under Andrasch Starke to join William Buick’s charge in the shadow of the post. Gosden, based in Newmarket, said: “Nathaniel has run a great race, a wonderful race and I am really thrilled with him. I couldn’t tell who had won as they crossed the line and I was on the line. “The winner has come back to her best. For anyone who was lucky enough to her win the Arc de Triomphe, breaking the track record and destroying all the colts - she is marvellous. “She didn’t handle the ground at Saint-Cloud the other day - she seems unhappy on loose ground - but she has come here and ran a blinder. Full marks to her. “Our horse has run his race quite brilliantly and look at the horses behind him. I am beyond thrilled with him and I can’t believe that, in two weeks, he can come back and put two races like that back to back. It’s quite impressive, so full marks to him. 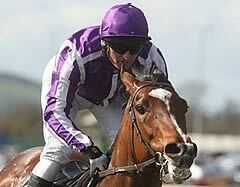 St Nicholas Abbey, trained in Ireland by Aidan O’Brien, finished third in the race for a second time. He was anchored at the back of the field under Joseph O’Brien and made up a lot of ground in the straight to finish just over a length and a half behind narrow victor Danedream. Aidan O’Brien said: “St Nicholas Abbey has run a good race. He was labouring after a furlong and Joseph (O’Brien) had to sit on him and give him a chance - we are delighted. Sea Moon, who was sent of the 2/1 favourite to take the feature race, finished fifth, just under two and a half lengths off the winner Danedream.